After all speculation and past history pointing towards the 3DS XL, the rumors were shot down clear out of the sky when Nintendo made no whisper about a new 3DS in there pre-E3 and E3 announcements. For more specs on the new 3DS XL, head over to the link in the bottom of the article. Reggie (CEO of Nintendo NA) has also promised the games will “Shine” on the screen, although the screen resolutions remain untouched, but I for one can’t wait to test out how the graphics look on these monster screens! The suggested retail price is 199.99$ and the 3DS XL will launch on July 28 2012 in Europe, and August 19 2012 for North America. 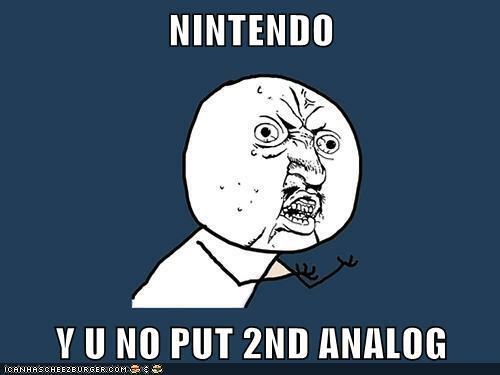 I have noted two things on this, the first of which is…WHERE IS MY SECOND ANALOG! The only logical reason I can come up with, is the fear of non-3ds XL users being left out, as developers will focus on the more flexible iteration of the console if it had the option of a 2nd analog. This means devs wont just make add-ons in there games to support the circle pad, but they would create games based on a 2nd analog being available (for example an FPS), leaving all the original 3ds users without support for the game (unless they own a circle pad)! Nintendo isn’t one to dump support on it’s user base in this manner, and in a way, they could be trying to live with the initial mistake of not including a second analog. I also noticed that Nintendo is attempting to take the PS Vita head on using the 3DS XL with two screens of almost the size of the PS vita screen, a super attractive price, superior battery life (on paper at least) and a new great lineup of games for the 3DS. This makes the Nintendo 3Ds XL an absolute handheld steal (despite my love to the PSP and PS Vita). The omission of the analog sticks, and sticking with the nubs makes sense for two reasons, the form factor of the device is flip style (due to it’s two screens) therefor an analog wouldn’t fit in it’s traditional form. Second, handheld devices are slimmer due to low profile buttons and analogs, this is to enable them to fit in your pocket easily (unlike my beloved Vita).